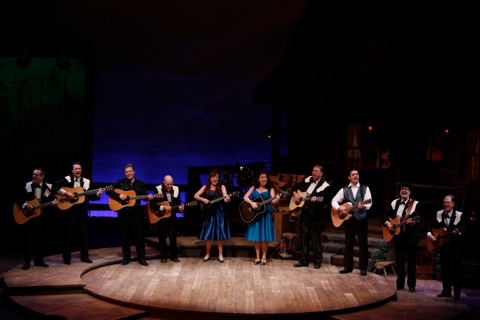 The four “principal” players gather for some of the music made famous by Johnny Cash in the Rep’s “Ring Of Fire.” Photo: Jerry Naunheim, Jr.
A rather unusual holiday show plays the Repertory Theatre of St. Louis Mainstage this year with a definite Nashville flavor. More of a concert than a musical, it’s “Ring Of Fire: The Music Of Johnny Cash.” As the name indicates, it’s not necessarily a biographical look at the Man In Black, but rather a celebration of his music. Outstanding musicians, mostly good singing and some sketchy acting at times makes for a show that country western fans will love. In fact, I’m sure it has the feel of a visit to the Grand Ole Opry. 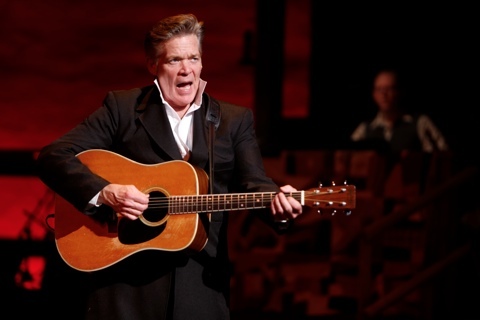 Derek Keeling belts out a number in “Ring Of Fire” at the Repertory Theatre of St. Louis. Photo: Jerry Naunheim, Jr.
As most folks who follow my blog and know me are aware, I’m not fond of either Country or Western and the two together often set my teeth on edge. I enjoyed “Patsy Cline” at Stages and that was a massive hit sending the show into the stratosphere of encores- even changing the theatre venue to accommodate the fans. And I admit the scripted musicals with country or bluegrass scores are among those I like- “Cotton Patch Gospel,” “Smoke On The Mountain” and even the lesser known “Robber Bridegroom.” But the twang of country for the sake of twang alone doesn’t always float my boat. 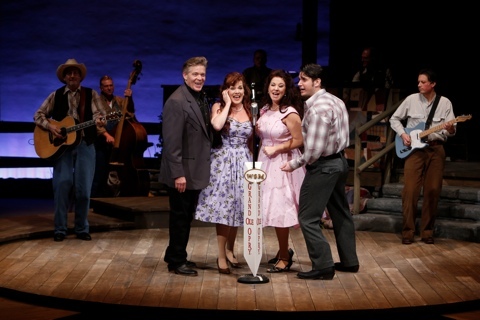 Featuring four “principal” characters all emulating Johnny or June Carter Cash, the show flows smoothly from one musical number to the next with the onstage band featured singing a lot of the songs as well as helping to relate the occasional update of moments in Cash’s life. Trenna Barnes, Allison Briner, Jason Edwards and Derek Keeling all hold their own and wisely don’t try to do “impressions” of either Johnny or June, but put the music out there lumped into various themes focusing on their lives. The second act opener features an impressive rendition of “I’ve Been Everywhere” at the Rep’s “Ring Of Fire.” Photo: Jerry Naunheim, Jr. Highly successful numbers include the opening of the second act when bassist John W. Marshall stands center stage as the audience is getting settled and slaps and strums the big bass with amazing results. Soon the other musicians join in and then the whole ensemble forms a curved line across the stage and performs “I’ve Been Everywhere” each taking a city or state within the song and singing it down the line like a vocal “peel” similar to a line of dancers. Sepia colored post cards pop up on a screen that serves as a billboard through much of the show and the result is an impressive blend of music and voices. Other outstanding musicians include fiddler Brantley Kearns, drummer Walter Hartman, keyboardist and accordion expert Jeff Lisenby and string players (guitars, mandolin and even a trumpet for that infamous “Ring Of Fire” number) Brent Moyer and Andrew Platt. 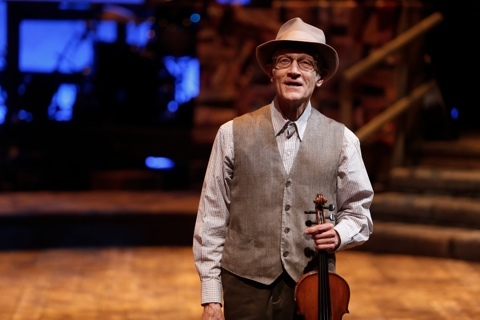 Fiddler Brantley Kearns steps into the spotlight at “Ring Of Fire” at the Rep. Photo: Jerry Naunheim, Jr. The more dramatic numbers are most effective including the story of the floods in Johnny’s youth as told through the song “Five Feet And Rising.” Then the prison sequence in Act II featuring the comic “Delia’s Gone” and the popular “Folsom Prison Blues” are a highlight along with the comic rendering of “A Boy Named Sue.” In fact, the second act far outshines the first as it closes with some fine gospel music that was also close to Johnny Cash’s heart. The aforementioned Jason Edwards helped create this concert for the stage and he also directed this production with Jeff Lisenby as musical director. Denise Patton provides the nice choreography and John Iacovelli’s smart set design features the cabin of Johnny’s youth dominating the stage left area and the billboard rising over the right. Kenton Yeager’s lights are precise and the projections designed by Joe Payne are exquisite. Lou Bird’s costumes are appropriate as well. So, as you may gather, I probably shouldn’t review shows like this because the audience seemed to really be into it on opening night. Just not a CW fan. But if you enjoyed “Patsy Cline” at Stages and love this style of music- particularly the always popular Johnny Cash, “Ring Of Fire” is the perfect night for you. It plays at the Rep Mainstage through December 28th. Give them a call at 314-968-4925 for more information or to order tickets. This entry was posted on December 8, 2014 at 9:43 pm12 and is filed under Uncategorized. You can follow any responses to this entry through the RSS 2.0 feed. You can leave a response, or trackback from your own site.